Sri Chaitanya Mahaprabhu has made this garland, Krsna Naam and Krsna Prem, and has come to this world along with His associates to place the garland on each and every one of us. 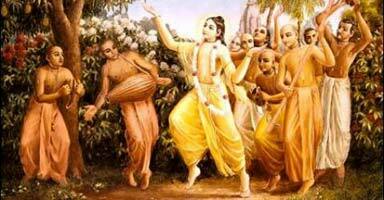 Mahaprabhu spread the holy name and the sankirtan movement like wildfire in Navadwip. Why did he take sannyaas? Because there were proud materialist people who escaped the network of his mercy. Now most fruit vendors, according to the demand of the fruit, they have a price. Lord Chaitanya and Lord Nityananda, the only price (they are asking) is our faith, that’s all. It doesn’t matter who we are, it doesn’t matter where we are coming from, it doesn’t matter what we have done, it doesn’t matter where we have been; all that matters is, we are willing to accept with some faith. Lord Chaitanya said, “I have brought so many of these fruits.” And he is appealing to all of his sincere followers, “I have brought from the spiritual world such a massive supply of fruits. I cannot distribute them myself. I want all of you to help me distribute these fruits of love of God through Krsna Naam, Sankirtan.” Therefore, it is such an intimate loving service to Lord to preach this message. When you are distributing books, when you are arranging the temple for a wonderful festival, anything you do within this movement that is helping to reach others, with Hari naam, with devotional service, you are actually participating in distributing these fruits, which is so very, very dear to Sri Chaitanya Mahaprabhu. Our beloved Guru Maharaja, founder Acharya Srila Prabhupada, there was no one since the time of Mahaprabhu and Nityananda who was so eager and empowered to take these fruits all over the world. Even at great risk, even at great pain…. how much he is dear to Sri Chaitanya Mahaprabu! That we understand through Chaitanya Charitamrita, and if simply as a servant of a servant of a servant of servant of a servant, anu, insignificant litter servants, if we just do what we have power to do, to assist him, how dear we will become to Sri Chaitanya Mahaprabhu. That is parampara. That is the real spirit of real parampara. By taking the real spirit of previous Acharyas in our life, we give the most pleasure to Krsna. Shri Chaitanya Mahaprabu, he has personally come, and he has personally empowered Prabhupada, and he has personally through previous Acharyas, he is asking all of us to help; he wants us to receive this garland of Naam Sankirtan and Krsna Prema from him. And he wants us to assist him in going person to person to person to person to place this garland of Sankirtan and Krsna Prema. That’s what it means… ‘He has put garland on the whole material world.’ He is making it available. How fortunate we are that Srila Prabhupada, he extended himself beyond any limits to give us this gift, understanding of the mercy of Lord Sri Caitanya Mahaprabhu. 7 Responses to "“Please help me distribute these fruits!”"
The sankirtan party goes each and every place and do kirtan there to spread holy name this is i think one of the greatest way to preach devotion to masses. 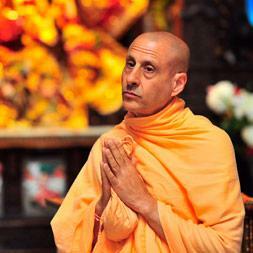 It’s very essential from what we have inspired and changed our life positively, we must share to others Like H H Radhanath Swami who is preaching all over the world for benefits of others. Hence Maharaja also asking to share the fruits of devotional service and sankirtan to others. Which we not help them but also after seeing the change in their lives our faith will also increase in Krishna’s holy name. Really Lord Chaitanya is most merciful incarnation of Supreme Lord who has given such simplest way to love God. By the causeless mercy of acharya and their dedication we are tasting these fruits. This article realized me that its our responsibility to assist for preaching message of Lord Chaitanya to all as token of gratitude to parampara. Thank you for sharing this beautiful message. 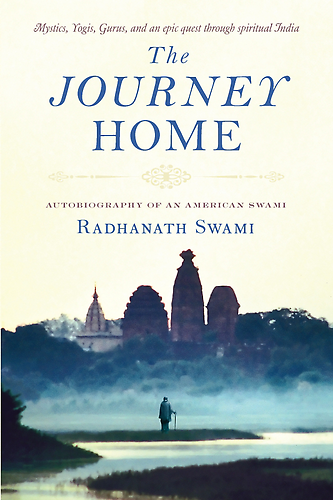 Nice analogy by HH Radhanath Swami Maharaj. Srila Prabhupad and all vaishanava acharya teaches us by their own examples to preach the message of the Lord Caitanya to distribute the love of God. Even if we can do some smallest service to preach the mission of Lord Caitanya to distribute the fruits of love of Godhead without our internal wrong motivation, then our life is success. Only God can be so merciful and compassionate that he wants to give the best to those who do not deserve it or rather hate him.